Editor’s note — This article originally appeared in the June 2013 print edition of Our Game Magazine. Nadim now plays for Sky Blue FC of the National Women’s Soccer League. Sky Blue kicks off its season on April 12, 2015. “Veni, Vidi, Vici,” was written on her arm in magic marker. “No, my mom would kill me,” she said. Nadia Nadim was born on Jan. 2, 1988, in Herat, Afghanistan, one of five girls in her family. She lived in Kabul, Afghanistan with her mother Hamida, father Rabena Khan, and four sisters Giti, Diana, Muskan, and Mujda. The family moved frequently when the girls were young because Rabena Khan was in the military. A hard-working, intelligent pair, Hamida and Rabena Khan lived a life of high expectations, pushing the limits and trying to lead better lives for themselves and their children. “I don’t remember a specific dream I had when I was living in Afghanistan, but I always knew I wanted to be successful,” said Nadim. The idea of being successful wasn’t something she saw on TV or read in newspapers — she had impressive role models to inspire her. During the late 1990s, Afghanistan was at war with itself. The Taliban, an Islamic fundamentalist political group, seized Kabul and established the Islamic Emirate of Afghanistan as it attempted to overtake the country. The Taliban would change Afghanistan in ways that Western society could not imagine. The rules of sharia law were implemented as a result of the Islamic Emirate of Afghanistan and it was extreme. Women weren’t allowed to go to school, work or even be alone outside. They had to be entirely covered with a burka, with only their eyes showing. They were not allowed to see male doctors unless a male chaperoned them, and if laws were broken, women were executed. “My dad’s friends told him to leave the country, and said to him, ‘Even though you didn’t do anything wrong, they don’t see you like that.’ But he loved his country so much, so we stayed,” she said. That was the last time anyone ever saw Rabena Khan. Nadim lost her father when she was just nine years old. Photo courtesy of Jess Madsen. Since there was no longer a man in the family, and with the strict rules implemented by the Taliban on women, there was only one choice for the Nadim family: They had to get out of Afghanistan. The Nadim family wasn’t alone in their endeavor to leave the country under these circumstances. 3 million, 95 percent live in Pakistan or Iran. “We were fortunate enough to have the money to do this,” said Nadim. “My father had a good paying job. So we had to drive to Pakistan and escape the country.” Nadim had family in London, so that would be their destination. The only way to London was through Jinnah International Airport in Karachi, Pakistan. The only way through Pakistan was to pretend they were Pakistani and pay for people to believe it. First Stop: Italy. With their entire lives packed in bags and suitcases, they had no idea where they were at any given moment, but the plane landed and they were on the move. From Italy, Hamida and her five young daughters packed themselves into a cargo truck where they spent several days and nights unable to make a sound for fear of being caught. Finally, one day, the truck stopped, but the expectations they had for a city like London weren’t quite met. The small town they landed in was called Randers. And it was during Easter weekend, which in Denmark meant the town was practically shut down. Luckily for them, a police station was nearby and a man was willing to help the family. From here, the family had to establish a way to stay in Denmark, though seeking asylum as refugees took a long time. Hamida accurately told their story enough times to convince the Danish government that her husband was a military general that was murdered in Afghanistan. Asylum seekers, as they are called, need a place to stay while in the limbo phase of requesting refuge. Asylums provide food, clothing, housing and school for families during this difficult time. The time spent at the asylum would have a profound impact on the Nadim women and would ultimately reroute their entire lives. Since Hamida was a teacher in Afghanistan, she had taught them a lot already. All of her children were really good at math, and since that didn’t require much of a language change, it was easily carried over to school in Denmark. After a little less than a month, they were transported to another asylum near Aalborg called Visse. There, they would wait almost six months for their answer. Right next to the asylum stood a football club called GUG Boldklub. The Nadim sisters took a liking to watching the club train. Eventually, they started fetching stray balls for them in the woods. And here she was playing at the asylum with kids of all ages and races, boys and girls. They were doing all the things they weren’t allowed to do in Afghanistan, and this would prove to change the course of their lives the most. When their time at the asylum was up and the family was granted refugee status in Denmark, they moved to a house in Rebild, about 30 miles from Aalborg. The Nadim sisters continued playing football after they moved, going from team to team, traveling long distances to train with good players and coaches. The time Nadim spent playing with boys at the asylum, added with her natural athleticism, made for a quality, young talent that was noticed quickly. Eventually, Nadim was chosen for the U-15 regional team in Denmark for the Nordjylland region. The team played in a regional tournament in Copenhagen where, for the first time, she was able to play against Denmark’s top talent. This was also the first time that long-time coach and mentor, Brian Sørensen saw her play. From this regional event came an opportunity with the U-17 youth national team, but playing for national teams posed a problem. Although she had lived in Denmark for the past four years, she still didn’t have her Danish citizenship. In Denmark, you have to live in the country for seven years before receiving citizenship. In the summer of 2006, everything would come together for Nadim. She had been playing for Sørensen (who was also the head coach at professional side Team Viborg) at the youth level for five years by this time. The 18-year-old was now getting offers to play professional football and Skovbakken IF was the first to imply a payment for her work, although Viborg also wanted her. Once she found out Sørensen would be the head coach at Skovbakken, signing with the club was still a difficult choice because playing in Åarhus meant leaving her family in Skørbing. Living in Åarhus with her family where Skovbakken was based out of, with the potential of a better education and work opportunities for everyone, was an ideal situation. 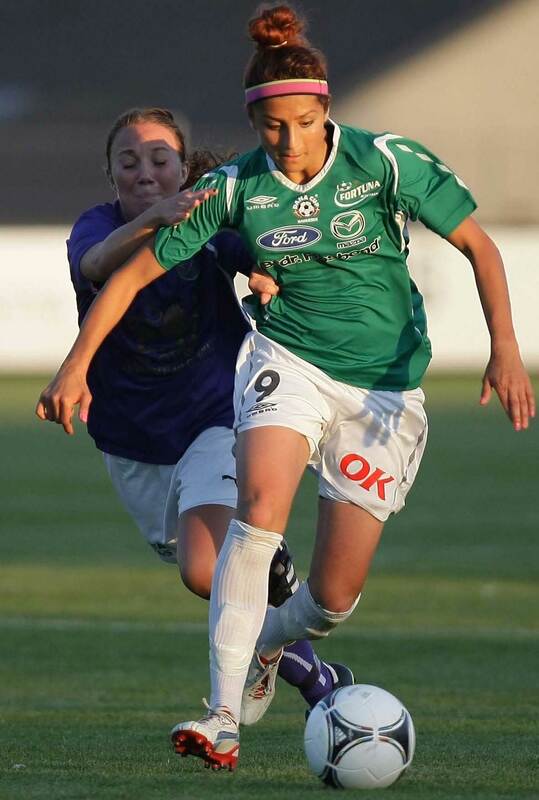 Nadim and her sister Giti played for Skovbakken together. Nadim ended up playing for Skovbakken for six years. In those six years, she grew a tremendous amount as a player and as a person under Sørensen. Off the field, he served as much as a mentor as he did a coach. With a background very different from the other players, coupled with a big personality, he always understood that she needed different treatment. “I always give her space and talked to her after or before games and practices because she doesn’t trust many people, so if you say something to her when her pulse is high, it’s hard to reach her,” he said. But the positives of a big personality and a lot of energy formed a passion for the game that isn’t always so common in women. In 2008, she was finally granted Danish citizenship, and could play for her new country. The next year, the national team coach called her and asked her to go to the 2009 Algarve Cup in Portugal. Her first match would be against one of the best teams in the world. Nadia was the first foreign player to suit up for the Danish National Team, men or women. This brought a lot of positive press and also extra encouragement that football was the right career choice for her. Photo courtesy of Mirko Kappes. On the other side of the spectrum, cultural norms started to become more apparent to her and her family. Hamida had to deal with a lot of negative influence from other Afghans in Denmark. After constant positive attention in the media about Nadim, local Afghans gradually changed their views. This was a big accomplishment for women’s football, especially for the Afghan community in Denmark. People would tell her they were proud of her and they wanted their own daughters to be interested in football. From this enthusiasm about creating change, she and a friend started a small football school project in Åarhus. The families that couldn’t afford to play for the football clubs needed a place to play and to stay out of trouble and stay safe. This was targeted more toward the Afghan community. Nadim and her friend did so much for the kids in the program. They bought them footballs, uniforms and football boots. They took the kids to tournaments in different countries and taught them the beautiful game. When Nadim isn’t on the pitch, she can be found in one of two places: at school or on the road. Last fall, she traveled an hour and a half to training and back in order to continue her education and play professional football at the same time. She has three more years before finishing medical school and reaching a major milestone in her life. 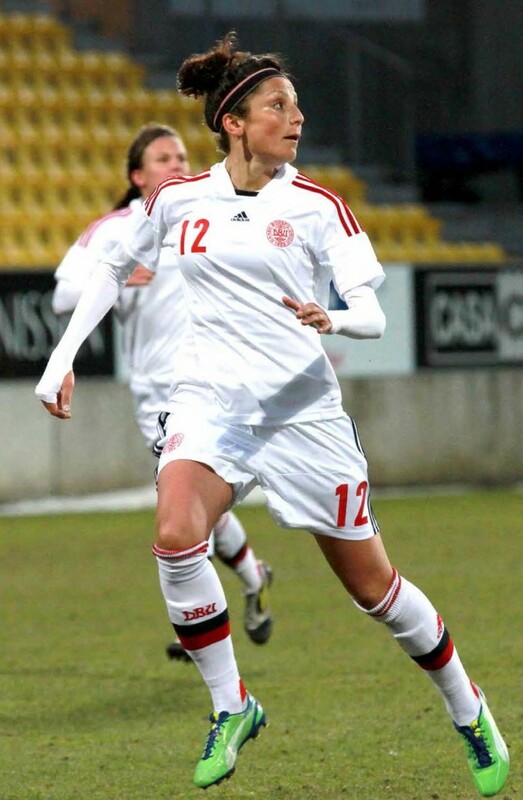 During this time, she had also started medical school at the University of Åarhus while she was playing professionally at Skovbakken and the Danish National Team. On top of that, she was helping her family financially by doing a newspaper route. It was nearly impossible to juggle everything. Unfortunately, she wasn’t able to continue working on the project with the football academy, though she hopes to start it up again one day. In 2011, Nadim followed Sørensen to Fortuna Hjørring, one of the top clubs in Denmark. The move to Fortuna was a natural progression in her career and something that would help reach her goals on the field. This summer is an opportunity for Nadim to showcase all that she has done in the past 13 years living in Denmark. A chance to represent her newfound country on one of the biggest international stages in women’s soccer. The EURO 2013 tournament will take place in Sweden next month. She’ll be one of 23 players selected for a chance of a lifetime — to reign supreme in the most competitive association in the world: UEFA. “We will meet the best competition in Europe and for me to compare myself against some of the best players in the world is an amazing opportunity and something I’ve always dreamed of,” she said. With 11 other countries vying for the same opportunities, Denmark has a difficult task. Nadim hopes this can be a breakthrough opportunity for them. All that she has been through has led her to an important few years in her life. The EUROs this summer, receiving her medical degree in three years and then the possibility of Denmark qualifying for the 2015 World Cup in Canada all weren’t possibilities at one point. For the other Nadim sisters, they too have thrived in their new country: Diana (22) is currently the No. 1 boxer in Denmark, the reigning EURO U-19 Champion, and one of the top three boxers in the world. Giti (26) studies medicine and plays professional football for Vejle. Muskan (19) is studying to be a nurse and will finish this year. Mujda (16) is in 10th grade and wants to study medicine. And Hamida currently works in the Afghan community to help maintain traditions while living in Denmark. Their successes in Denmark, juxtaposed with what their lives could have looked like had they stayed in Afghanistan, is mesmerizing. The freedom to do their best and follow their passions is something the Nadim family has never taken for granted and will continue to propel them to new heights. They came. They saw. And they’re all conquering. Tiffany Weimer grew up in Connecticut where she earned herself the opportunity to play soccer for Penn State University. She holds the Big Ten all-time goals record (91) and was a 2x runner up for the Hermann Trophy. From Penn State, Tiffany played for many teams all over the world, had a handful of call-ups to the US U21 and senior women’s national teams and at 29 years of age, continues to enjoy scoring goals for her team. In 2010, with co-founder Khaled El-Ahmad, Tiffany created Our Game Magazine and has been at the helm ever since. Aside from the magazine and playing, Tiffany is also involved in coaching for girlsCAN Football and blogging on her personal site.